Most people wouldn't want to eat something that has the word "choke" in the name. Most people don't know what's good for them. But I digress. Sometime around 1633, in a book called "New England Prospect," William Wood wrote, They be much smaller than the English cherry, nothing near so good, if they be not very ripe; they furr so the mouth that the tongue will cleave to the roof, and the throat wax hoarse with swallowing those red bullies (as I may call them) being little better in taste; English ordering may bring them to an English cherry, but they are as wild as the Indians. Henry Thoreau, feeling a little more charitable and adventurous, wrote, They are a rich, fatty-looking fruit. However, though they are scarcely edible, their beauty, especially when they are half-ripe, atones for it. See those handsome racemes of ten or twelve cherries each—dark, glossy, red; semi-transparent? You love them not the less because they are not quite palatable. However, finding some once near the end of August dead, ripe, and a little wilted, they were tolerable eating—much better than I had ever tasted—yet the stones are very much in the way. It's true that they are not exactly a free-snack-on-the-trail type of wild food—though I have never tried them dead, ripe, and a little wilted—but behind that choking astringency is a powerful cherry flavor just waiting to be coaxed out with some sugar. Last year I bought a little bottle of local chokecherry syrup at the co-op, and it was amazing, so this year I was determined to make my own, even though I've never made fruit syrups or anything like them before. It's a little late to be going a-chokecherrying (two weeks ago would have been ideal), but I found two trees still heavy with berries and a handful of other with some stragglers, and limiting myself to the easy fruit, leaving plenty for the birds, I still managed to come home with about three and a half pounds of chokecherries. The berries grow in bottlebrush-like clusters (I've also heard them described as grape-like) and the ripe berries come off easily in your hand if you just start at the top of the cluster and pull down, wiggling your thumb and forefinger as needed. 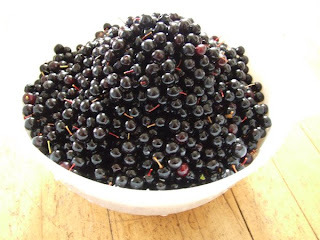 I set out a little late, just before dusk, and it was dark by the time I started heading home, but by then I had picked enough chokecherries that I didn't need to see them, because I knew the fruit by touch. Three and a half pounds of chokecherries measures out to about ten cups, and cooking them down brings you to about six cups juice. I juiced them by first mashing the cooked berries with a potato masher, then pressing them though a sieve, then squeezing the pulp through a cloth, although mashing and squeezing would have sufficed. 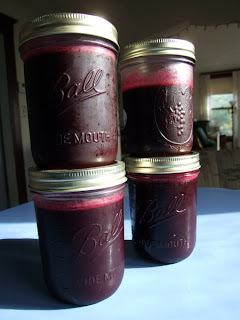 It should be noted that chokecherry juice will stain your hands and kitchen utensils and countertop and everything you love a red-pink-purple. I made the syrup four days ago, and the crevices of my hands are still lined with purple cherry juice. Dissolve the sugar in the juice and boil steadily for five to ten minutes; the more sugar you use the less you have to boil it. You can adjust the sugar to your taste; I used 4 1/2 cups and wish that I would have stopped at 4, so that it would have a little bit more of a tart cherry zing. Stir constantly to prevent it from boiling over. The syrup will thicken as it cools. Yields a little under four pints. It will keep for several months in the fridge, or you can can it and keep it longer. Use on pancakes, waffles, ice cream, etc. The little bottle I bought at the co-op last year was eight ounces and cost me $10; five hours "work" (hiking through the woods and picking berries, then cooking them down on the stove) yielded me about eight times that. 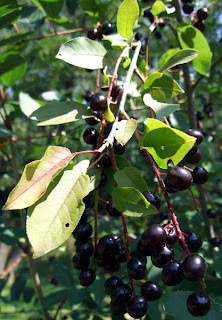 Factoring in my hourly rate at my day job, it's far more economically profitable to make my own chokecherry syrup, and even if it wasn't—how would I rather spend my time? It's not much of a contest, really. Every time that you post, it makes me want to move away from Dallas a little more. I miss wild berries and brush and seeing birds other than pigeons and insects other than roaches! Maybe I just need to get a Texas field guide and pay a little more attention. I was all set to say, "No, I'm sure there's gotta be *some* naturey places inside city limits." But then I tried googling stuff like, "dallas texas wildlife" and, geez, yeah, there's really not a lot out there is there? Hie thee to the countryside. Or Duluth, I guess. But I'm sure there's something. Weedy lots? Overgrown, abandoned parks? There is nature lurking everywhere. Hummingbirds should be passing through Texas now or soon, and you guys get *tons* of hummingbirds. We usually just get one species up here.